Margaret Thatcher's name is always likely to provoke an opinion - whether it is an expression of devotion or one of extreme dislike. The MP for Finchley remained in power for 11 years, making her the UK's longest-serving leader of the 20th century. She is also regarded as one of the most controversial. Whether you are in the devotion camp, or fall into the dislike category, there is no doubting her impact on the country. The following comments reflect the balance of opinion we have received. Though Thatcher's policies might not have been good for this individual person or another, overall Britain should thank her for saving Britain from becoming an economic basket case/socialist welfare state such as Germany and France have become. About the mining industry, most of those had to be heavily subsidised to keep them open and there comes a point when the subsidies you put in are no longer worth it and that's where you stop doing that. Her only fault was not withdrawing Britain from the EU, which continued to destroy agricultural and fisheries communities as it pleased. When Margaret Thatcher was elected I started my first year at university. Very quickly in the face of her Reagan-inspired "hard ecomonics" and austerity treatment I saw every possibility of employment at the end of my course evaporate. 3.3 million were unemployed with no hope of a job. The economy went into recession and the dole was being withdrawn unless you could "prove" you were actively searching for work. It ruined millions of people's lives and put millions more into unproductive boredom and hardship. It cost the country �40b in lost productivity and the only thing Margaret did was make it worse. Norman Lamont told us that "If it ain't hurting it ain't working", but the truth was it was just hurting. Meanwhile as the City of London got richer on public share sell-offs and massive bonuses for cost-cutting, the Yuppy was born into a "me first" society. People forget how bad it really was. The idea of celebrating such comprehensive failure is laughable. I remember, as a student in Glasgow, going to see Keith Joseph speak, with the intention of booing him off the stage. But I decided not to start booing until I heard something to boo. His points were very clear and simple. If you use taxpayers' money to subsidise jobs the money is unable to find its way into the economy to wherever it may be used more efficiently. I decided not to boo at all. I decided to wait and see if they could achieve what they said they wanted to. The Thatcher years were a turning point for the UK. Before Thatcher the old industries were still struggling along, subsidised by the taxpayer. No one noticed that this was killing off any chance for new industries to take their place; we were used to mediocrity. The transformation was brutal, but it was worth it. Instead of a knackered shipbuilding industry, and politicised mining and car industries we now have industries that actually make money - IT, pharmacueticals, oil exploration and still (though foreign-owned) a car industry. The transformation of BT, BP, British Gas and the removal of the burdens of Coal and Steel convinced me that the Tories were right. I remember seeing the front pages on the day after election day 1979 and feeling sick as I knew what was to come. I remember my dad saying that it was strange that after all he'd seen he would die under a Tory government. I'm pleased he did - to see what the Labour Party is now under Blair and the rest would have been terrible for him. Simply put, she was one of the finest leaders this country has ever seen. Difficult problems require difficult decisions and unlike today's "wimps", she could deliver. "Maggie Thatcher, milk snatcher" - "Maggie, Maggie, Maggie, out, out, out". This is how I remember Mrs Thatcher. My father worked as a trade union official and I saw first-hand the devastation she brought to families all over the country. Thank god her day is over. With one decision, that of taking away school milk Mrs T, took away my only source of Calcium, as a result I have suffered and am suffering to this day in pain. She may have saved money but ruined my life. I suffer from lack of calcium in my bones. Every day is painful and every day I think if only I had milk at school. We were too poor then to afford it at home. My message to her is don't be too proud of your achievements. You may have been considered a good leader but you stepped on many peoples' lives to get there. Jim Callaghan said of her "the further one is from the UK, the more she is admired". She shook the UK's tree and dragged it kicking and screaming into the emerging globalisation. She created opportunities and allowed enterprise to escape the trappings of unionism, defeatism and poverty. She prepared the UK for the 21st century. Well done. My memories of the Thatcher years are of destruction. The destruction of British industry, of public services, of public housing, of the concept of society. Destruction of compassion and concern. Destruction of decency in public life. I would never compare Margaret Thatcher to Churchill but rather to Hitler. He set out to destroy Britain but failed. Margaret Thatcher set out out to destroy British society and almost succeeded. I cannot understand the respect and adulation lavished on this spiteful and vindictive woman. My first impressions on hearing of her appointment were neutral bordering on reserved. I was vaguely aware of her tough talk about the morass of the British economy, largely due to the corruption of the British spirit by the creeping cancer of socialism. Britain had become a social welfare state after WW11, (this despite its resolute and heroic performance during the war in standing as a bulwark against Nazism) and the economy of this once proud and independent people, was in ruins. As a Canadian of British descent (both English and Scottish) I had a strong emotional attachment to the motherland of my ancestors and thus recall feeling some degree of humiliation that my once great motherland had been so undermined by the socialist economy. I remember feeling therefore a vague sense of hope mixed with cynicism that this tough-talking woman might actually give Britain back her pride. That she would be able to accomplish this task to the degree that she did I could not possibly foresee. I believe that Britain will be forever in her debt despite the fact that many bemoan the social costs of the surgical knife she used to cut away the non-productive tumors and revive the health of the British economy and give national pride back to Britain. I was 18 when Margaret Thatcher was elected. I remember being thrilled that at last a woman might bring common sense, gentleness and compassion to the dirty world of politics. Sadly this person did not live up to my expectations. She had the chance and she blew it! I'm one of Maggie's children. I regard this in much the same way as an abused child would regard their alcoholic mother. Thatcher was an evil, twisted woman who encouraged greed and isolation. she decimated the North of England and virtually destroyed my father during the miner's strikes. I remember one Christmas particularly, during that dark time. The rotary club turned up at the door with a food parcel complete with turkey, veg and a small bottle of sherry. This was our Christmas - all I can recall of Thatcher's wonder years was imminent threat of redundancy and penury. Maybe Thatcher did something good for the country, but as a child growing up in Newcastle, I am at a loss as to what this good actually was. I guess I'm one of Thatcher's children through and through being 13 when she came to power and 29 when she was dumped. What she taught me was that you take responsibility for your own actions and destiny - if it doesn't work out don't blame the state/govt. You need to look to yourself first and foremost. My family background is working class and no one before me had been to University. She gave me a sense that I didn't have to settle for second best but I could set my sights as high as I wished. I now own and run a profitable marketing company that has generated many millions in tax and provides 60 jobs as well as giving me a good quality of life. She created the culture and environment that allowed me to make this happen. No jobs, no money, no power, no dignity. No chance. Had Maggie done to a person what she did to Britain, she'd have been locked up for ever. A strong leader is not necessarily a good leader, ask any country under the yoke of a tyrant. She gave the country the kick-up-the-backside it needed. I am a trade unionist, but she was right to curb union power. The Sixties and Seventies was a long-running saga of union power ruining companies and consequently the national economy. Sadly the site of yuppies "waving their wads" jarred against the image of the less fortunate living in cardboard boxes. I think she meant well, empowering those who were willing to help themselves, but the lack of a social conscience will forever be levelled at her door. She is without doubt the worst thing that has ever happened to large parts of our country. I hate the idea that one day there will be a statue in Westminster to commemorate her period in office - it�s a sad indictment of how our ruling classes measure success. Unlike those political classes that fall into the Love category and drool over her at dinner parties or the �I didn�t get here today without hard work� mob that thinks she was wonderful, I can show you the devastation she caused. I remember the Task forces she sent into battle and the communities and industries she destroyed without a tear because she was the fearless iron lady. But I also remember she did have a tear for her self when she was leaving Downing Street for the last time. She taught that greed is good and that I come first. Well I'm sorry Margaret: I come from a better place. You might think that I am some hardened trade unionist or lost my job as a result of her policies, but you would be wrong. I never lost a day's work throughout the 18 years of Tory rule and throughout I was a top rate taxpayer getting steadily better off. But you cannot judge her time as a success when so many had to pay a huge price for some of us to be better off. I hate her for what she has done to my father. We lost the house during the recession and he has never been the same again. Anyone who believed Thatcher was good for the country is no friend of mine. Even if I don't believe in Mr Blair's policies, I can relate to him. He is a family man - seems human and is more than capable of saying sorry - which he has done on various issues. I don't even think she was human. Made of steel with not a drop of warm blood in her soulless body. I think she left a wonderful legacy. She was so extreme that the Conservatives are now unelectable. Many thanks Margaret. It's noted that all the comments for her are from the English. They weren't forced to endure her practically hanging "closed" signs on their country. She single-handedly managed to shut down mining in Scotland and Wales, managed to shut down much of Scotland's industry. Is it any wonder that the Tories were chased from Scotland a few years ago? There will be no tears up here when she dies. Margaret Thatcher could at times seem awkward and off-key, but this was far from the case. She transformed the political climate in Britain in a way that few other had done in the 20th century. She broke the corrupt union power and transformed both the Conservative and eventually the Labour parties to appreciate the value of freedom and enterprise. She was the worst PM ever, racist through and through, brought misery to all home owners in the 90s, putting up interest rates to 18%, while all her rich friends enjoyed higher returns on their millions. I remember very well when Margaret Thatcher came into office after the fiasco of Edward Heath. She came in when the country was in a very bad way, she took on the unions and the nationalized industries and put the country on its feet. I think that the present labour government have done so well simply because of the legacy left to them by her. You only have to look at France where I am now living and see that they still have 3 million unemployed and have had for 30 years. Without Margaret Thatcher we would have been in the same boat. I remember the poster of Britain with the queue, the caption, ''Britain isn't working''. The unemployment figures had past a million. Thatcher is elected, not only does it reach 3 million, but stays at 2 million for much of her time in power. Margaret Thatcher a leader who led, was not afraid to take tough decisions and was admired around the world. It appears the only people who disliked her were the lazy and idle who expect something for nothing. A great lady. While I do think that the legislation introduced to reduce the power of the unions and dispution of srike action was to the general future benefit of the UK, what I can never forget or forgive Thatcher for was the vindictive way that she systematically destroyed the coal mining industry of this country. It was done not for any economic reason, it was pure out and out revenge for the actions that brought down the Heath government. In a time when we are importing more and more energy from overseas we may live to regret giving up our own natural resources. Lord Acton said: "Absolute power corrupts absolutely" and by the end of her era Thatcher was a case in point. As many have said, I remember Seventies Britain and the country trashed by socialism. This woman was brave and I find it such a shame that such a great & charismatic leader was eventually so cruelly be treated by the press and consequently by the section of the British public who needed a 'baddie' to blame for anything and everything on. I have every sympathy for the victims of inefficient industries whom lost their jobs, but you blamed the wrong people. I've heard stories of schoolchildren today, voting Mrs Thatcher as the most evil person in history! What on earth is influencing these kids? A great woman. A great politican. Nobody seems to have mentioned the destruction of the printing industry. Yes some of the work practises had to be changed but at what cost ! Was it really necessary to push the working population onto the streets in protest and have the country at each others throats. The result was a country split , as my employer said to me " now it is our turn for the next 50 years". Companies became ruthless in their treatment of their employees and society has became a selfish one where people have little regard for each other. I look at today's Yob culture which has grown from this era and wonder where we go now! What? No mention of her support for apartheid? I respect Mrs Thatcher as a politician with a clear political vision; a far cry from Mr Blair who endeavours to be all things to all people. Her legacy though engenders less respect. In no area is this clearer than in housing. Council house sales combined with hyper inflation in the housing market, mean little choice today for those needing a home in either the public or private sector. Ironic really when you consider that a "property-owning democracy" is supposedly one of her achievements. I remember the Thatcher years all too well. She destroyed the principle of community, by default, following a stupid monetary policy, now disowned by its crazy mastermind, M. Friedman. Her worship for Reagan, for me, brought about the worst global years, dominated by a right-wing frenzy, which we are seeing again with Bush. Some people give her credit for moving England forwards by killing off the unions, but there really is no evidence apart from a catalogue of boom and bust years. The Falklands war was handled very badly and the sinking of the Belgrano was amatuer, and further exclaimed her ruthlessness. Her simple-minded application to the most complex questions were bullied through with little respect for the social order of our nation. An intelligent approach would have been to rationalise a social structure based on ethics and a real understanding of people and their backgrounds. Thatcher had a simple-minded rationale based on those who have, have and should have more. The true conservative, so to speak. Thatcher could not think beyond the archane stigma of her own languid personal development and sent us into years of ill health. She should never be congratulated for anything she ever put her wretched hands to. She was the last great Prime Minister of my lifetime. The reason we have had a strong economy in Britain for so long is thanks mainly to Mrs Thatcher and her policies. She knew how to clean up the mess left by the dustructive Labour policies of the 70s. This did mean pain for many at the time, but she had the vision to put long-term growth first. On top of this she liberated Eastern Europe and of course Kuwait, and would never have let herslef be told what to do by the American President. It is very sad to see so many people apparently waiting for a chance to dance on her grave. Even the current government owes her for the economic foundations she set. We should have more respect. I'm so very tired of the Thatcher defenders describing her as tough and straight-talking, as if these qualities are enough for a leader. Plenty of dictators around the world share these characteristics but we don't condone them. Anyone whose social circle includes Pinochet has to be unpleasant, don't they? During the 1980s my personal memories of Margaret Thatcher were of five out of six brothers being out of work at the one time. It seemed like companies with household names closed weekly throughout the North West. Whilst work was found eventually either by "getting on our bikes" or by taking up alternative work, I only have to look at what my particular close knit family has become. A shadow of it's former self. Second and third generation members scattered to the four winds. When the younger members meet up periodically they are all like strangers with only scant knowledge of each others personal lives . That woman was responsible for changing the mindset of a nation. Never again will we be known as the refuge for people less fortunate than ourselves. We are now the "sod you I'm alright" nation.We have created a generation of people who know the cost of everything and the value of nothing. A number of my friends and myself (all classed as professionals and all from different parts of the world) have agreed that we will save our mutual celebrations to honour Margaret Thatcher not for reaching the status of octogenarian but when she finally spins of this mortal coil and we can maybe start to rid ourselves of her memory. I live in the heart of the northern mining communities, and the hang-ups people have round here are pathetic. Get over it. My father was a police officer in the miner's strikes and was subject to all kinds of abuse. Thatcher was right to crush these do-badders and sort out industry in this country for good. If not for a forceful government back then, it would be even worse now. Just wait and see what the legacy is of this wishy-washy Labour government is. Thatcher was, and still is, great. The rest of the world loved her, and so should we. My wife and I lay awake that night in our South London flat listening to the election results with a deepening sense of foreboding. We were in our early 20s, had just started married life, embarked on exciting careers, full of optimism for the future. The next 18 years destroyed that optimism and severely tested our beliefs. We struggled to bring up our children in Thatcher's Britain, a bleak, joyless, life-denying country where a rapidly disintegrating society became increasingly obsessed with personal gratification and the mindless pursuit of wealth. While we had no idea that night just how destructive Thatcher's governments would be or for how long she would pursue her vicious vendetta against working people, their culture and traditions, one thing was perfectly clear: the British people had accepted the Tories' bribes and voted with their wallets. They would do so again and again. As for Margaret Thatcher herself, I sincerely wish her many happy returns [on her 80th birthday]. May she live to see the communities she ravaged, the beliefs she mocked, the society she said did not exist, flourish once more as a permanent reproach to her life's bitter work. Thatcher destroyed social cohesion and replaced it with a "grab all and to hell with everyone else" philosophy in Britain which has been slow to fade, sadly. Most of my memories of this period are of large scale unemployment and people being told to ride bikes to find work - we should all have been Lance Armstrong by now. There was an attitude in No 10 that it was the fault of these formerly hard working people that they were without work. Some areas in Wales and elsewhere are still trying to recover from the damage done. I, for one, will not be raising a glass to her health - after all, she did nothing for anyone else's. In the long run I hope that the history of this time will show the level of outright despair in large sectors of the population rather than paint her as being heroic for "winning" a war she could very well have avoided. My only happy memory of this period is the night before she resigned when, whilst getting in her limousine she said "we fight on, we fight to win" only to resign the next day. I laughed till I cried that day. She was quite simply the salavtion of the nation and I'm not talking as some grammer school boy. Britain was headed for economic ruin and she changed that - it involved great turmoil and pain for many that shouldn't be belittled - but she did not do it for fun as some seem to think. And it's the very same turmoil countries such as Germany and France now face because they didn't reform. As for these Northern towns with their "heart ripped out" - go and visit them; yes the steelworks or the docks are gone but replaced by shopping centres and light industries. People do different things now but are far more affluent with far greater choice in their lives than they had in 1979. One of these comments mentioned "people in northern towns" now being far more affluent. In circumstances where this is true, it has NOTHING to do with Margaret Thatcher; it has everything to do with the Labour government treating the working class like citizens and not the expendable underclass that they were in Thatcher's Britain. This comment is laced with bitterness and hatred and I make no apology for it with regards to Mrs Thatcher. Without doubt that woman is the most reviled politician of the 20th century. From denying milk to children to getting herself re-elected via the Falklands war, to her actions in N.Ireland, to her economic annihilation of her own country, to her responsibility for spawning the "me me me" generation of the 1980s, she is the most evil person to have ever been let loose in British politics in history. I grew up in a Britain that was continually banging on the doors of the IMF for handouts because we were broke and where the lights were continually going out because of yet another strike. Margaret wasn't perfect and in the end she had to go, but she had the guts to stop the rot. She changed in a parliamentary term what should have been changed in umpteen terms before her - if we had had leaders with her courage. That drastic change caused pain and anguish when a gradual change would not have. People blame her when they should blame her predecessors. She faced up to the realities of the developing low-cost economies when those that went before looked inwards. She was a true conviction politician who would wipe the floor with all today's soundbite peacocks. Britain is a better and a worse place because of her. I have no doubt the business I work in now would not have survived without her entrepreneurial legacy. British Steel went from being an outdated monolith to a world leader in technology steels. I now work in a business where unions and managment work in a balanced partnership to succeed in a world market place and secure jobs. The management or the workforce are no longer seen as the enemy - unemployment, poor performance and competitors are the threat. I agree with other contributors that the focus on the individual has created a culture of greed and perhaps reduced community spirit as well as impacted crime but her leadership has made Britain a more vibrant, determined country that can pay its way hold its head up. If that means suffering a few chavs then so be it. Margaret Thatcher: love her or hate her. That's the point. Her main legacy is a deeply divided nation, and there are as many who loathe and despise her political actions as those who admire or even idolise her; as many who suffered hardship and distress under her government as gained. As many as there are who want a statue of her, just as many will want to disfigure the statue. She can never be a national heroine, never a Churchill. I remember leaving the country to work abroad, and leaving by ferry so that I could watch the country slowly fade from view. I was furious. I was so angry with Thatcher from having turned the country from a moderately barmy but acceptable place to live to being a place where greed was acceptable, profit was preferred and people mattered very little. It had become a land of snobs and louts, curiously mixed together. I return to the UK frequently. My job demands that I do so, but I am rarely tempted to want to stay. Britain has become a vicious, nasty society and, while no thanks to the present incumbent of 10 Downing Street, it was Thatcher who pushed the country over the abyss. Without social cohesion or a sense of society, no amount of economic profit is worth it. There can be no denying the fact that Margaret Thatcher inherited a country pretty much on its knees. She had a clear vision of what was required to fix it. She understood that tough decisions needed to be made and she had the courage to make them. I don't think the idea of whether she was liked by the public much concerned her, she had a job to do and she was going to do it and do it she did. The social impact on her policies was immensely painful for many people and my view is she recognised that and did her best to support those who were immediatley effected by the changes that needed to be made. I am not clever enough to know whether history will be kind to her but there's no denying she was a politically brave Prime Minister. I just came out of the Navy, went straight into a private run steelworks. She cut the prices on steel-making goverment-run factories. The private-run works could not match these prices and went under. At the age of 28 I was on the scrapheap, and was told I was too old to work in a Goverment job. That's how I ended [up] here in Canada. What a bloody horrid woman. Mrs Thatcher was a tremendous leader who put the Great back into Britain and gave us back some national pride. During her time she grew the numbers of home owners and started the creation of a prosperous Britain, respected by world leaders, including America�s Mr Reagan because Mrs Thatcher was a strong leader. It all went wrong when the sycophants that had surrounded her meant she lost touch with the ordinary people in the street; but it was no excuse for the grey suits' treatment of her. When Britain regains another strong leader, rather than a bunch of spin doctors she will again become Great Britain! The woman was - and remains - pure evil. Virtually everything that is wrong with modern UK values - or rather lack of them - can be traced back to her and her cronies. Above all else, she forced the country to believe that the only thing that mattered was yourself or just maybe self plus friends and family. On top of that, her near-criminal cut-price self-off of public assets and privatisation of public services has led directly to the lousy profit-driven rubbish we endure now. Margaret Thatcher will go down in history as the finest post-war Prime Minister to date without any doubt. 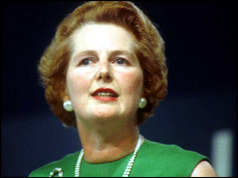 She fundamentally changed our country, effectively ending the era of post-war socialism which had diluted personal responsibility and accountability and allowed an entire generation to be conned into believing that Britain did not have to be competitive and even worse irresponsible unions that effectively destroyed entire industries due to intransigence. It's ironic that many of these people had to bear the painful effects of change. It's to her credit that she laid the platform that Tony Blair has inherited. There's much in common between them and I suspect that she was the right woman in the right place at the right time! I find it sad that a moment of history when a woman managed to lift herself into a position of responsibility should be wasted on someone so full of hatred for anyone who wasn't "one of us". I hope that she will use her remaining years on this planet to try and understand those who feel differently as, at the moment, history will judge her a bigot who cared nothing for those who did not agree with her political viewpoint. The imperfect peace which the people of Ireland now enjoy has been achieved in spite of her hatred and remains a tribute to those of all political persuasions who followed her. In short all she owes us is an apology and an milestone such as this is a good place to start, particually on the BBC. Over to you Maggie. She made the country believe in itself again. After years of bowing to the unions under Labour and the spineless leadership under Heath, Maggie Thatcher made us all realise one important fact: if you work hard, you succeed. If individuals succeed, then so does the country. I am sick and tired of hearing about the miners. NOBODY has the right to a job for life. If you are in an industry that is inefficent, then so be it. You cannot blame Maggie for the fact that UK coal production was inefficient compared to production in the Far East. Why? Because the miners demanded too much money for what at the end of the day is an unskilled job. Maggie, you made us believe in ourselves and for that I thank you � as will future generations. Me first. Own your own council home (which, in time, you'll find difficult to sell on). Looking after number one. Boom and bust. Industrial action. Civil disobedience. Alienation of minority groups. Crush the poor. Strikes. Privatisation. Selfishness. Good grief, what an astonishing deal of self-pity is turning up here! It would be quite easy to say that Mrs Thatcher did as much damage to the professional class as she did to the working class. Both groups dislike her. and indeed for those who dislike a classless society (communists and aristocrats) she was bad news. If anyone is responsible for today's "classless society" - for good or for ill - it is she. What should also be remembered is her staunch opposition to Soviet communism. I remember being in Hungary in 1989, and whereever I went there were pictures of Mrs T. She was a hero for the people of the countries behind the iron curtain. She wasn't an attractive personality but at least you knew where you stood with her, unlike one other PM in particular. She was very far from being all things to all men, and we should be grateful for honesty in our leaders. The breakdown of "community" that is so often pinned on her can equally well be blamed on the welfare culture that made slaves of citizens. And the comprehensive school system too, was an invention of the socialists. After all, one of the best ways to keep "the people" under control is not to educate them - knowldege is power after all, and best not let the hoipolloi have it. Mrs Thatcher went a little way to redressing the balance, but not far enough. Dreadful woman who set this country back centuries. Her divisive policies destroyed communities, making the rich richer and the poor poorer. Where there was hope, she sowed despair. I despise her and her legacy. My memories would be of a Britain ruled by the trade unions and the country being thrown into chaos because an electrician had the audacity to pick up a plumber's screwdriver, and any other of many reasons for striking. High taxation, devalued pound, high inflation where other fond memories, but best of all my first job interview where I was told the job was mine by the company but only if the union accepted me. Oh and let us not forget the political Levy. Compulsory payment for the Labour Party (without a choice). Coming from a working class family I was told that we where not to vote Tory, but that Britain was not me. So thank heavens for my first election and Maggie and the Tories. If nothing else we got Britain back. Whether you think Mrs Thatcher as PM was strong in decision making, forthright in views or just politically robust, at the end of the day her political agenda was, at best, flawed, and at worst, evil. Yes the unions etc. of the 1970s had to be sorted out, but our manufacturing base was irretrievably damaged, not just by policy but based on a class agenda. I remember all the strikes, no bread, the dead unburied, power cuts, it being cheaper to send every British Steel worker on holiday to Spain than subsidise them, British leyland always on strike. No point in working harder as all the extra went in tax. Margaret Thatcher ended all that - she realised that the world didn't owe us a living, we needed to concentrate on what we were good at. Unemployment was two million, now its only 200,000. Communism removed from the world. We owe her a great debt. Thanks to Margaret Thatcher's influence on British politics, Britain has become a materialistic, superficial, Saatchi & Saatchi nightmare, where nobody seems to care about their fellow man, and the health and well being of the nation is secondary to the personal egos of the maniacs who run it. I can't remember how many times people I knew lost their jobs, companies, houses, as Thatcher sat smugly with her bootlicking sycophants, enticing the British police to turn to thuggery against their fellow countrymen, ordering the British Forces down to some lousy rock in the South Atlantic and seeing 1,000 people die in order to win a general election. If only the people of Britain realised she was a true enemy of the people! I was at a grammar school in 1979, which was in imminent danger of being closed by the dogmatic socialist government. Fortunately, Maggie won the election and my school was saved. I'm getting a bit bored of ex coal miners harping on about what happened 20 years ago - they obviously don't care about our environment, or the pollution coal causes! They remind me of out-of-work ivory hunters, or redundant workhouse managers - a relic of the past. Do they not remember that Maggie never lost an election? She can't have been all bad! Redundant Dad, no electricity, chicken wings one Christmas day, the cold, no hot water, no toilet paper, hand-me-downs. Mum crying. We never had it so bad. Never again. Enjoy your 80th, Mrs Thatcher, my parents never got to 70. Dear, oh dear. Some of these submissions are incredibly self-centred, small-pictured. Do these people (mainly Scots and ex-miners) not remember the state of Britain in the 1970s? Paddling through rubbish, bodies unburied, strikes, power cuts, spiralling inflation, limited working weeks, abysmal production, etc. Thank God she gripped the nation and pulled it back into some shape. Her Employment Acts reshaped working conditions and tipped the balance of power away from the unions who seemed intent on bringing the country to its knees. Her handling of the Falklands War actually made the Soviet Union watch carefully as it realised the West (in the form of Britain) had a genuine political will, conviction and, most importantly, the hardware to fight a war independently 8,000 miles from its homebase. It was a contributory factor to the end of the Cold War. Home ownership, economic stability and growth, essential transition from a manufacturing economy to a service based economy as befits a developed country. We'd have reverted to an agricultural economy if she hadn't exercised her customary vision and leadership. Privatised firms such as BT are now global players - you couldn't even find a working payphone pre-1979! Ask yourself why ours is now the 4th strongest economy in the world (and don't be deceived into thinking it was Gordon Brown's doing!). Incidentally, try comparing her straight-forward, brutally honest style with that of today's government. She demonstrated integrity and moral courage. Phoney B Liar doesn't even come close. I'm proud to be one of Thatcher's children. My memory of the Thatcher years is mostly of strikes, the Falklands war and political turbulence. But what I remember the most is the way she conned the working classes into thinking that being self-employed, owning a few shares, or a council house somehow meant their lot in life had improved. Meanwhile the real money was going into the pockets of fraudulent corporate boards and city yuppies. Many hard working people were duped and lost everything when the bubble inevitably burst. Her true legacy is the depressing Chav culture of today, the flip side of the "aspirational" 1980s. I worked at a large hospital for learning disabled people. I remember dedicated cleaners being made to apply to their jobs for less wages. Within months of the cleaning being contracted out the wards were filthy, morale was appalling, and the most vulnerable suffered the most. It was symbolic of what Thatcherism did for this country. She was a patriot and a pragmatist. She fought hard for our rights (the rebate in Europe) and recognised that the age of coal and government by the communist-led NUM was over. Have we, as a nation, suffered without our coal being dug out at great cost with the permanent threat of strikes? She was a libertarian and a believer in personal responsibility. She gave the people the money to choose how to spend it and taxation was reduced FOR ALL. She gave the poorer the right to their own home, one of her most successful policies. It allowed millions to escape poverty today by having control over their own property and finances. When she left office the nation was fitter, richer and stronger. Whatever some of your bloggers write, she will be seen as a genuinely great Prime Minister in history. Please note, I voted Labour in 1974, twice. We all make mistakes. As a young child growing up in Thatcher's Britain. I was terrified of the woman. I remember the intense fear when small that we might have a nuclear war. I grew up under her government in Chatham, a town with a once-prosperous dockyard, closed down during the 1980s. [I was] educated in the last year of a closing down school. We were led to believe there wasn't much future for us. In fact, in what would probably now be regarded as an unusual move, our headmaster said as much in his "inspiring" speech to us when we left. I was glad to see the back of her. Seeing her crying on the steps of number 10 was a great day for this country! When Mrs Thatcher was in power she enabled us to buy our council homes. I did and from that I now live in a lovely area. For that alone I hold her in great regard. Having lived through the Thatcher years, I can assure everyone that they were grim, desperate times. As a student in the 1980s, I saw how underfunded schools were and how demoralised teachers were. When I left school and college, there were no jobs, only precarious jobs with criminally low wages. We had high interest rates, so we all struggled to afford our mortgages. We were conned into the "share-owning" culture, where much was invested but little given in return. We lost our jobs in "boom and bust" whilst those at the top made millions on the high returns. We were urged to reject a sense of community, in favour of individualism, selfishness and greed. We are now seeing the social problems created by this evil idealogy. While living in London for 10years, I found her tenure as British PM despicable which divided a nation, created an underclass and let hunger strikers die in Ireland. A stain on the political landscape. People forget what the UK was like before Thatcher - not being able to go to school because no fuel, rubbish in the streets, power cuts. The UK was the laughing stock of the world - she changed all that and changed our society into the dynamic force it is now. Sure, we had boom and bust, but remember, before we just had BUST AND BUST. Once we understood how to deal with economic growth (not seen in the UK before Thatcher) we were able to sustain it under Chancellors Clarke and Brown who both use free market principles introduced by Thatcher. I remember Thatcher as the woman who was always in the news during my childhood years. All the other faces changed regularly except the face of Britain. Further just a small note. All the comments I've read say how bad she was. So I don't understand how she could win three elections in a row. If you all hated her so much why was she re-elected two times. Pretty weird if you ask me. Whilst you may not agree with her policies, you must surely recognise her achievements. For a woman to become Prime Minister and hold that position for 11 years is remarkable. During that time she transformed the country beyond recognition, in my view for the better. There were casualties from her policies, but there were also a great deal of beneficiaries. We live in Thatcher's Britain today, not Blair's. She is possibly the greatest peace time Prime Minister in British history. It is notable that the comments supporting the actions of this woman are mainly from people living abroad - USA, Canada, Switzerland. Whereas those of us who remain have to deal with divided societies, lack of ambition and opportunity for many working class people (who typically would have found employment in the now non-existent manufacturing sector), and not knowing neighbours and friends - unless they come round to complain. Tolerance and respect was eroded by this woman and that is her legacy. One of the reasons we left UK. I come from Consett, County Durham. Unemployment by 1981 was 36% yet today, thanks to Maggie's policy of concentrating on small private business rather than state-owned "public" monstrosities it is a boom town - despite the predictions of the doom merchants when the steel works closed in 1980. The legacy is that the UK now has the highest standard of living in Europe and the lowest rate of unemployment. For those who do not believe this I suggest that they look at other countries which are laden down by the bureaucracy that we also had in 1979. My memories of Margaret Thatcher were of growing up on a Council estate during her entire time in office. My hopes and aspirations for the future were removed as she and her cronies slashed public spending. I saw the crime level rocket and her political allies all benefitting with their own fingers in the till. I find it hard to believe that anyone would ever give her praise. The sense of community that existed in my street was long gone by the time her own party kicked her out of number 10. Good riddance. Most of the comments I have read so far appear to be from bitter blue-collar workers crying over lost jobs and the death of the trade unions. The reason why this country is now prospering whilst the rest of Europe is dragging its feet is because of the markets-based economic policies implemented during the Thatcher years. And what is Blairism? Merely, a continuation of Thatcherism but with a new spin. And death of the old industries (mining, shipbuilding etc) - its called evolution. Manufacturing output in this country continues to rise (jobs fall due to technological advances) and those lowly paid manufacturing jobs are replaced by higher-paid service jobs. And this is not coming from some posh Southerner as most of the socialists would expect. I grew up in the Northeast, from the heart of the old shipbuilding industries, but my success has been enabled by Thatcher's policies of opportunities for hard-working, entrepreneurial types (remember the rise of the Barrow Boy). In conclusion, this country will continue to benefit for many years due to the hard-nosed Thatcher reforms and future politician (either New Lanour or Conservative) will continue to embrace markets-based politics, which she invented. In 200 years our descendants will review the 20th century for influential British Prime Ministers and there will only be two names: Winston Churchill and Margaret Thatcher. The former saved us from Nazi tyranny and the latter saved the British economy. As a boy growing up on Tyneside I was subject to the torture of Maggie's reign. In the 1970s ships lined the Tyne, by the time Maggie finished the only boat left was the Shields ferry. Instead of following my family into the yards I was put on a YTS at �17.50 a week. Cheers Thatcher. I came to live in this country in 1979. I lived the first 19 years of my life in the US and then moved to the outer reaches of Scotland and subsequently became a British citizen. When I heard there was a woman prime minister I was incredibly impressed that my new beloved adopted country had taken a step towards greater equality. Let's face it, I'm still waiting for the world's greatest superpower to elect a woman for President. Sadly, this woman was not an inspiration for me. I saw a lot of unhappiness, struggle, depression, and anger in the British people. Of course she changed the course of British politics and her legacy is seen in a very wishy-washy Labour government. For me, personally, I remember those years as if they were some kind of Dark Ages. I couldn't get a job and my partner and I struggled financially buying a house we could not properly maintain. I visited cities in England that were staunchly Conservative around the end of the 1980s - Salisbury, in particular. I had previously been there in 1974 and the main city centre had been a lively bustling place. By the end of the 1980s I walked down the same streets and found many of the shops were empty. Salisbury was a shade of its former self. So much for Wiltshire being blue! I guess I can thank Thatcher for one thing: her vision and steely determination to change Britain has only affirmed my desire to be a socialist. She was fortunate to have governed when she did. Ronald Reagan made her look like a genius. I was going to school passing Green Godesses on the streets and rubbish piled up in peoples driveways. Maggie was elected and things got worse, miners went on strike, Argentina invaded the Falklands and unemployment went sky high. But things started to get better and have continued to do so almost without reverse ever since. It is very easy to be popularist and rubbish her achievements but in my opinion she changed this country for the good, not quite Churchill but not far short! Will never forget leaving the pub and seeing cars stopped in the street with horns going, lights flashing and people cheering in the streets. She was necessary but had gone too far towards being a demagogue. I don't know much about management of a country. However, I dol know it demands much courage to carry out your plan. Iron methods have to be conducted to get a good perspective, sometimes with blood and death. I had gone back to college at the age of 40, in 1987, to study international relations and political science. 1990 was some year! When she lost the first vote, and finally when she left, I remember people running around campus singing Ding Dong the Witch Is Dead! Of course, I remember her last PMQ when she did rather well and everybody got a bit sentimental, including the Beast of Bolsover who was wagging his tail. Christopher Morrison, USA Although still only 13 I had grown up through the heartache and desparation she enforced upon my family and many others. Attempting to strengthen this country whilst sacrificing millions was never a good sign of leadership. Her final nail in the coffin, the dreaded Poll Tax pushed this country too far and finally the Iron Lady broke. I remember as a child realising something big was occuring in politics, perhaps something positive....only, to find a few months later the first Gulf War happened. I punched the air with delight when she resigned because I knew then that it would not be too long before Labour got back in. She ruined this country. She closed all the industries and left skilled people without work. That has now left Britain at the mercy of the world at large for the materials made by the industries that she closed. Her reign was a shameful blight on Britain's history. I was on the underground and picked up a newspaper that had been left on the seat. I remember reading the headline and exclaiming out loud, "ring the bells!". A man sitting opposite me smiled quietly to himself. Years of switching off the radio whenever she came on were behind me. What a glorious day it was! I arrived at my office and a colleague told me that Margaret Thatcher had resigned. I literally leapt with joy - I was so happy that we were finally rid of her. A great day. What a glorious day and what a shame her morally bankrupt legacy still permeates a party saturated by selfishness and a divisive snobbery. Reading these comments is more evidence of how Thatcher divided this country. My lasting memory of the Thatcher years is watching Trevor McDonald at the end of the news listing off the 1000s of job losses in our major industries and the 100s of job gains in new supermarkets. I remember in 1990 when she stood on the steps of Downing street saying she had left Britain in a better state than when she first arrived, four million unemployed, economy in recession, our schools and the NHS falling apart, I don't think so. There is one thing I will thank Thatcher for - that her reign of individualism and greed will never let the Tories back into power.